Courtney Ward who did her undergraduate work at Tulane and is now finishing her PhD at the University of Oxford in England is a rising star in the field of gender studies in archaeology. In the medieval period, she notes that the gendered use of space can be seen, for example, in the diverse placement of areas, such as the sacristy, in convents and monasteries. She will discuss how art and architecture reveal medieval masculinity in monastic settings in her afternoon talk. In her evening talk she notes a tendency that still exists to view jewelry and personal adornment purely as the realm of wealthy women. In contrast, Ward will discuss 31 skeletons, and their varying social class, age, and marital status; she will explore how forms of jewelry also reveal gender identity in late first-century A.D. Herculaneum. 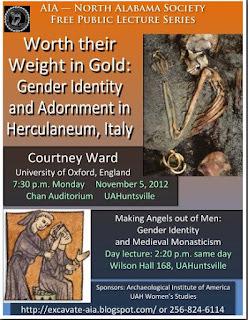 "Worth their Weight in Gold: Gender Identity and Adornment in Herculaneum, Italy"
When Did Human-Neanderthal Hook Ups End?